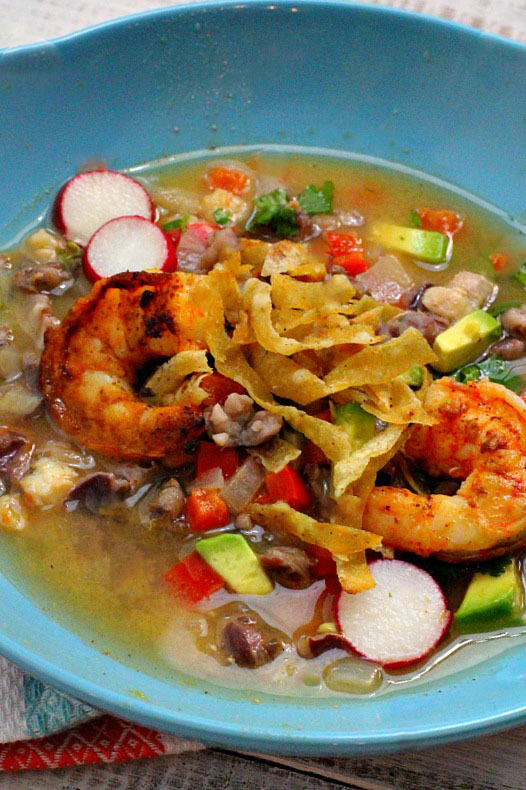 Spicy, salty, and savory, this Blue Corn Posole with Shrimp hits all the right notes. A healthy Southwestern posole soup that comes with holiday tradition. 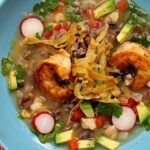 Although it’s not tradition to use Shrimp in a posole-style soup, this brothy bowl of Southwestern flair turned out to be hearty and wonderful with flavor. 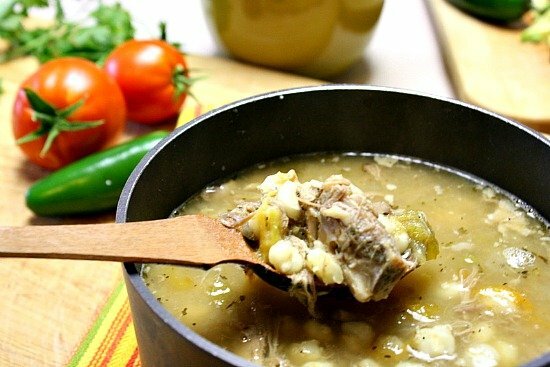 Traditional posole, which actually means hominy, is mostly made with pork. It’s a New Mexico stew served during the Holidays and especially served on Christmas Eve. 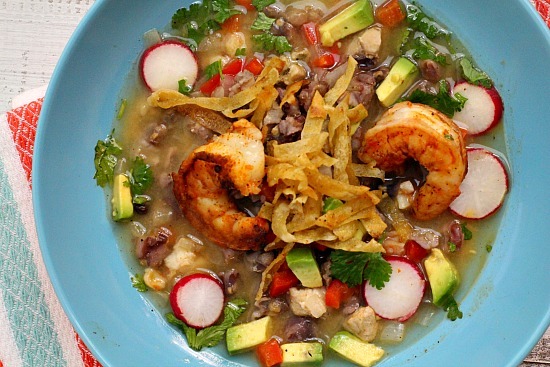 This posole includes so many of my very favorite foods…shrimp, avocado, cilantro…and posole (hominy.) Garnished with fresh radish, a crunch of fried tortilla strips and chunks of creamy avocado brings even more personality to the party. 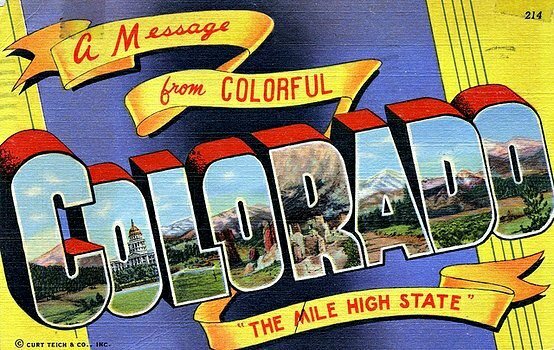 On a recent trip to New Mexico, I found myself hauling home as many New Mexico food specialties as I could get my hands on. Blue Corn Posole being one. 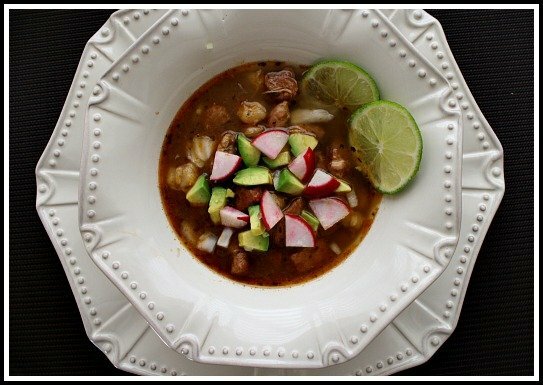 I’ve included an affiliate link for your convenience if you’re interested in shopping posole. Blue corn posole has a slightly nuttier flavor than white posole. It was fun to experiment with and to use in this soup and it paired beautifully with the sweet meat of sauteed shrimp that had been dusted with New Mexico Red Chile Powder before cooking. You can use dried white hominy for this recipe, or to make this even easier, use canned hominy. If you decide to use canned hominy, no need for soaking overnight, or even using the crockpot at all. Canned hominy would make for an easy stove top version. It’s hard to resist this rainbow colored bowl of goodness. And if you’re a regular reader, you know that a brothy bowl of soup is about the only diet secret I’ve ever known. And when I’m feeling the need to feel a bit thinner, like after my glut of mashed potatoes and pumpkin pie last week, I go on a soup binge. This posole is so flavorful you absolutely don’t miss the fat or the calories. Please note that these beautiful shrimp get their color from a dusting of New Mexico Red Chile Powder. Sauteed stove top, they’re then added as more of a garnish as to keep that beautiful brick red color, along with the crunch from frying. Shrimp that have twisted into an O-shape are overcooked, rubbery and sad. 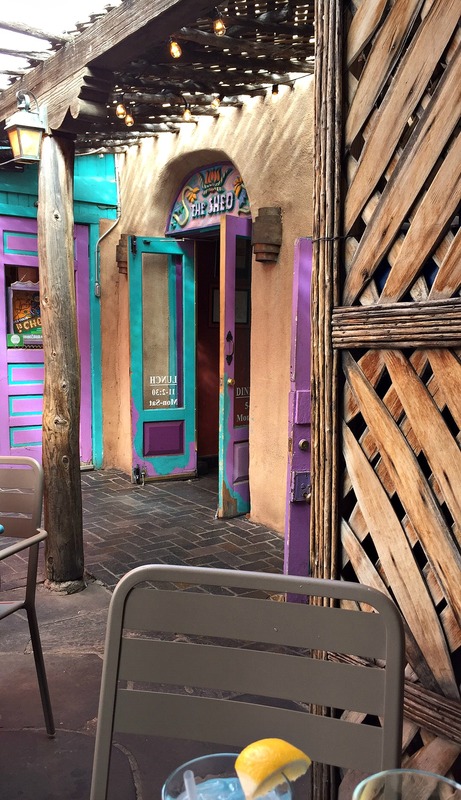 On our recent trip to New Mexico, we spent a day in Santa Fe and had lunch at The Shed, a restaurant rated to be the best Mexican Restaurant in New Mexico. Of course, the food did not disappoint, absolutely New Mexico fabulous. 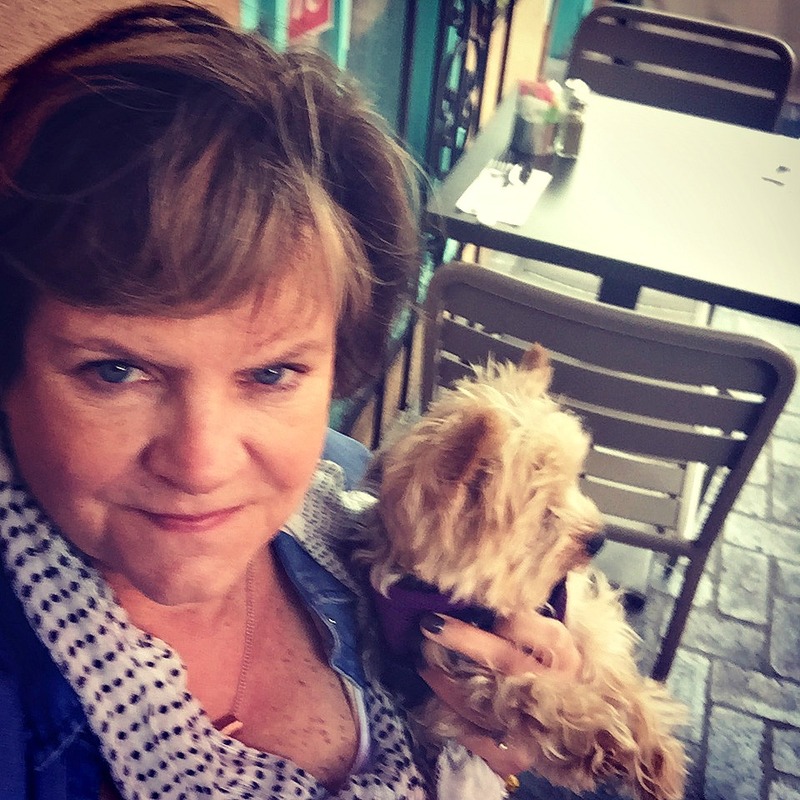 We travel with our dogs whenever possible. The Shed Restaurant has a cozy outdoor patio area that dog friendly. We made reservations and alerted them that we’d be accompanied by two small Yorkshire Terriers. Upon our arrival, they not only had water glasses set for us, but a water bowl for our dogs. Now that alone was even more impressive than that fine New Mexico cuisine. This is a photo of Zia and myself enjoying the patio ambiance. 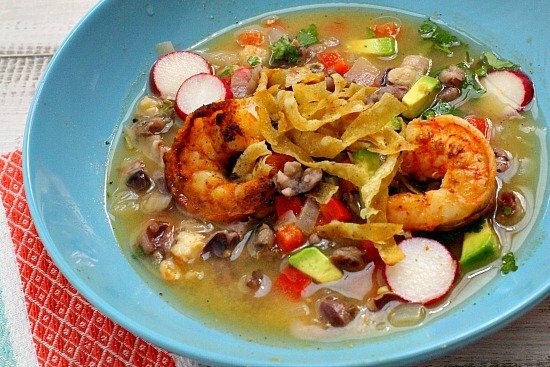 A brothy healthy version of Posole soup. Measure out one cup of dried blue corn posole and rinse well in a colander. Place posole in a crockpot and cover with 2 cups water. Let posole soak overnight. The next morning, drain posole. Put back in crockpot and add chicken broth. Cook on low all day - 8 hours. Peek every once in a while to make sure the broth isn't running dry. An hour before you're getting ready to eat, add oil to a hot skillet over medium high heat. Sautee onion and bell pepper until just getting tender. Add the onion, bell pepper, and spices to the hominy. Cover and let cook on low 1 hour. Just before serving, sprinkle shrimp with remaining Chile powder and saute until done. About 2 minutes per side or until shrimp form a "C" shape. Set aside and keep warm. Chop a few of the shrimp into smaller than bite sized pieces. Stir into the hot soup. To serve, ladle soup into bowls. garnish with avocado, radish, cilantro and fried tortilla strips. Top each bow with 2-3 whole shrimp. Homemade tortilla strips: Cut fresh corn tortillas into strips. Add pam to a heated skillet. Add strips and cook, turning often, until crispy. Salt when finished. Please note that these beautiful shrimp get their color from a dusting of New Mexico Red Chile Powder. Sauteed stove top, they're then added as more of a garnish as to keep that beautiful brick red color, along with the crunch from frying. 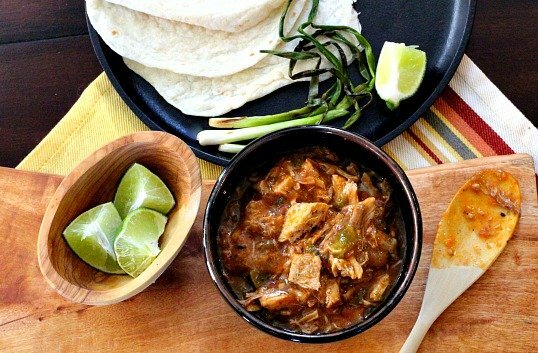 I love this twist on posole! You know, I’ve never made a posole with blue posole and certainly have never used shrimp. But this looks SO GOOD. Love seeing new flavors with New Mexico ingredients. Will have to make this!